I came across this small vignette when looking for some 1/35 scale Australian heads. Produced by Firestorm Models in Australia the kit offers some interesting World War I Commonwealth figures in a small trench setting in Gallipoli in 1915. The scene is most probably based on a picture I found in the Imperial War Museum from that campaign. Not many British or Commonwealth 1/35 World War I troops exist so this is a pleasing find and a link to a past bravely fought campaign, that saw a large waste of life for nothing gained. As with many battles of WWI the term Lions led by Donkey’s comes to mind. This comes packed in a professional sturdy box with the product and manufactures details on the top and a colour picture of the finished product. Inside the box is the vignette base and three 1/35 scale Commonwealth Troops plus their equipment. The set is cast in a cream coloured resin and the figures and base look to be free from any damage or cause for concern. 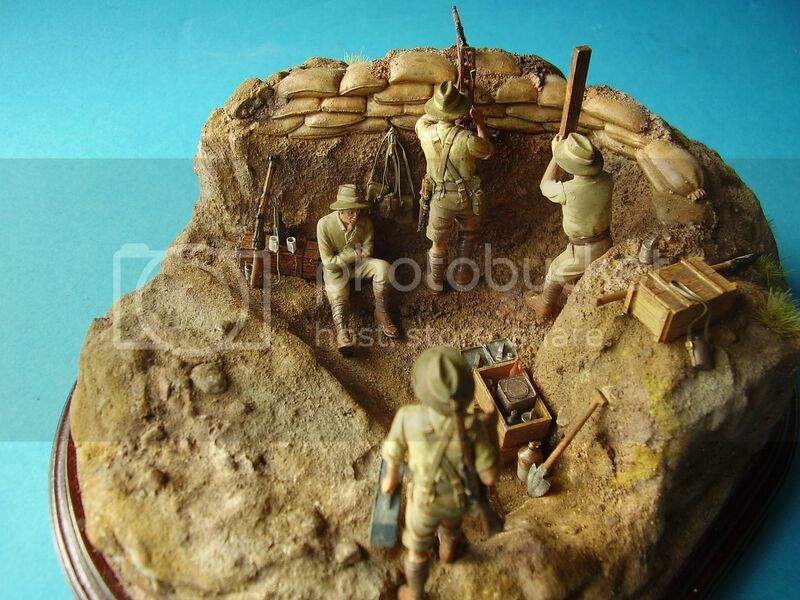 The base depicts a trench setting in Gallipoli, 1915. The trench is well sculpted with rough earth walls and sand bags on top. A small equipment/food box is also cast into the floor of the trench. The base measures 96mm x 75mm and has a height of approximately 65mm. Overall, a nice little base to mount the figures on. The detail seems good so this should paint up well. My only dislike of the base are the 3 large flat edges but this may be perfectly acceptable to figure painters. No instructions come with the kit but the build process should be evident from the accompanying coloured picture on the box top. One of the 3 man set comes as a seated Australian/New Zealand soldier. Posed sitting with his back against the trench wall and with arms folded, with the left leg raised for support. The figure is very nicely cast with good folds and creases in the uniform. Dress consists of open necked undershirt, KD trousers with keen high putties and boots. Around the waist is a 1908 pattern web belt and slung over the left shoulder and across the chest is a bandolier of .303 ammunition. The detail on the figure is excellent. To round this one off you get a separate head with an ANZAC felt hat. Both are well sculpted and come as individual items. The sniper comes as a standing figure with open necked undershirt, shorts, knee length putties and boots. The figure wears standard 1908 webbing consisting of belt, ammo pouches, shoulder straps, water bottle and carrier for the head of the entrenching tool. The webbing would appear to be a good representation of the 1908 pattern. The brasses and buckles are really well done, Again this is a very well sculpted and cast figure. To complete the sniper you get a Mk1 bayonet, attached to which is the helve for the digging tool. A separate head is supplied but one that is somewhat out of keeping with the scene as it appears to be wearing a Mk II WW2 helmet! The arms come as separate items with the sleeves of the undershirt rolled up. Overall a very pleasing figure with excellent detail. The final figure is that of a standing observer, this time dressed in undershirt with rolled up sleeves, long KD trousers, putties and boots. Around the waist is a leather belt. Separate items include the two arms which are holding a trench periscope and a separate head with a ‘diggers’ hat. The arms and periscope are cast in a blue-ish coloured resin. To add to the scene you get 2 Lee Enfield rifles which are quite nicely done although perhaps a little thin, 2 water containers, 2 water bottles, 2 pouches, 4 open tins of food, 1 closed food box and 1 open box without a lid. For the sniper you get a small wooden raised two part structure to hold a rifle allowing it to be fired from the shelter of the trench. The standing figure measures 44mm from heel to shoulder, so the height is good for 1/35 scale. Body proportions and build/pose look highly appropriate and accurate to my reference. Facial detail on all the heads is extremely well done. Little clean up, if any, is required on the base. The figures and equipment have the normal pour stubs to be removed. There are some small seam lines on the putties and arms that will need dealing with. A very well sculpted and cast set of detailed figures with a pleasing and interesting setting. I was very impressed with the overall quality of the parts, although the Lee Enfields seem a bit thin to me. I’m not sure how the WW2 helmet crept into the scene, all the pictures of British/Commonwealth troops I’ve seen in Gallipoli show them wearing soft head gear. The Helmet Mk I was designed by John Brodie and patented in 1915. It didn’t enter service with the British Army until the summer of 1916, so it is not appropriate for the time frame of Gallipoli. This is a vignette that should be of particular interest to figure painters and those interested in this time period. The quality of the sculpting and casting is excellent and you get sufficient additional items of equipment to complete a fairly accurate depiction of a moment in history. The Imperial War Museum image shows a fourth seated soldier to the right of the standing sniper. This was my first encounter with any of the Firestorm products and I am not disappointed. I do not know if they have any distributors in the USA or Europe/UK , so the down side here was in the high cost of postage to the UK. I emailed David at Firestorm about the WW2 head and he confirmed there should have been extra heads in the set, one with no hat and one with. Highs: Excellent sculpting and an interesting battle scene. Lows: Wrong head gear for one figure (see afternote). Verdict: Highly Recommended (see comment on postage). I pick up this kit about 4 years ago at my lhs. It is a well depicted kit in itself. Knowing I'd never get around to it, I passed it on to a friend. Like yours, it only came with the 3 heads and no others. But mine did include a small instruction sheet for the snipers rifle and holder?, the wood part for firing out of sight. Fire Storm has some nice large figures, p/u the Assie in new Guinia, 120mm I believe.